大塚攻 (2006) カイアシ類・水平進化という戦略―海洋生態系を支える微小生物の世界. NHKブックス. pp. 260. ^ Boulton AJ, Findlay S, Marmonier P, Stanley EH, Valett HM. 1998. The functional significance of the hyporheic zone in streams and rivers. Annu. Rev. Ecol. Syst. 29: 59-81. ^ a b Susumu Ohtsuka, Ikuo Takami, B. A. Venmathi Maran, Kazuo Ogawa, Takaki Shimono, Yusuke Fujita, Manabu Asakawa & Geoffrey A. Boxshall 2009. Developmental stages and growth of Pseudocaligus fugu Yamaguti, 1936 (Copepoda: Siphonostomatoida: Caligidae) host-specific to puffer. J. Nat. Hist. 43: 1779–1804. ^ a b c 青木淳一 (1999) 日本産土壌動物―分類のための図解検索. 東海大学出版会. pp. 1076. ^ a b 岡田要 (1965) 新日本動物図鑑〔中〕. 北隆館. ^ Nielsen, LB. 1966. Studies on the biology of Harpacticoida (Copepoda, Crustacea) in Danish beech leaf litter. Natura Jutl. 12: 195-211. ^ Shimono, T., N. Iwasaki, H. Kawai. 2007. A new species of Dactylopusioides (Copepoda: Harpacticoida: Thalestridae) infesting brown algae, and its life history. Zootaxa 1582: 59-68. ^ Fiers, F., V Ghenne. 2000. Cryptozoic copepods from Belgium: diversity and biogeographic implications. Belg. J. Zool. 130: 11-19. ^ Kikuchi, Y. 2000. Terrestrial harpacticoid copepods from the forests in the imperial palace, Tokyo. Mem. Natn. Sci. Mus., Tokyo 35: 99-101. ^ a b Land, M.F. (2012) The evolution of lenses. Ophthalmic. Physiol. Opt. 32: 449-460. 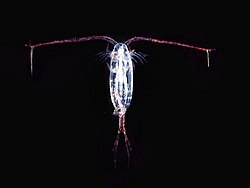 ^ Jerome J. Wolken and Robert G. Florida (1969) The eye structure and optical system of the crustacean copepod, copilia. J. Cell. Biol. 40: 279-285. ^ Gregory, R.L., H.E. Ross and N. Moray (1964) The curious eye of Copilia. Rep. Nat. 201: 4925, 1166. ^ Boxshall GA (1992) Copepoda. In: Harrison FW, Humes AG (ed) Microscopic Anatomy of Invertebrates Volume 9 Crustacea. Wiley-Liss, New York, 347-384. ^ Terwilliger, N.B., and M. Ryan. (2001) Ontogeny of Crustacean respiratory proteins. Integr. Comp. Biol. 41: 1057-1067. ^ Marcus, N.H. 1996. Ecological and evolutionary significance of resting egg in marine copepods: part, present, and future studies. Hydrobiologia 320: 141-152. ^ Coull, B.C., J. Grant. 1981. Encystment discovered in a marine copepod. Science 212: 342-344. ^ Deevey, E.S. 1941. Notes on the encystment of the Harpacticoid copepod Canthocamptus staphylinoides Pearse. Ecology 22: 197-200. ^ Lee, R.F., J. Hirota, A.M. Barnett. 1971. Distribution and importance of wax esters in the marine copepods and other zooplankton. Deep-Sea Res. 18: 1147-1165. ^ Kotani, Y. 2006. Lipid content and composition of dominant copepods in the Oyashio waters analyzed by the thin layer chromatography flame ionization method. Plankton. Benthos Res. 1: 85-90. ^ Peter Herring 2002. The Biology of the Deep Ocean (Biology of Habitats Series). Oxford University Press. pp. 330. ^ Frost, B.W., M.R. Landry, R.P. Hassett. 1983. Feeding behavior of large calanoid copepods Neocalanus cristatus and N. plumchrus from the subarctic pacific ocean. Deep-Sea Res. 30: 1-13. ^ Lee FE, Nevenzel JC. 1979. Wax esters in the marine environment: origin and composition of the wax from Bute Inlet, British Columbia. J. Fish Res. Board Can. 36: 1519-1523. ^ Syuhei Ban 1998. Dormancy in copepoda. Oceanogr. Japan 7: 21-34. ^ Hairson, N.G., R.A.V. Brunt & C.M. Kearns 1995. Age and survivorship of diapause in a freshwater copepod. Ecology 71: 2218-2223. ^ 小野寿彦, 高橋永治 (1991) 日本淡水動物プランクトン検索図説. 東海大学出版会. ^ 水野壽彦 (1983) 日本淡水プランクトン図鑑. 保育社.